When I was around ten, my dad gave his battered old copy of If Only They Could Talk by James Herriot and told me I would love it. He was right. The tales of a vet’s life in the Yorkshire Dales in the 1930s were beautifully told, charming, hilarious and rather special. I went on to read all Herriot’s memoirs (James Herriot is a pseudonym), and truly loved the characters (human and animal) which he wrote about. Every so often I still take the (now very) battered paperbacks off my bookshelf and curl up on the sofa to lose myself in Herriot’s world. So when I was offered the chance to read and review The Vet: My Wild and Wonderful Friends by Luke Gamble, billed as a 21st century James Herriot, I thought it was my lucky day. Treatment and technology may have advanced, but animals haven’t changed so surely there would be more hilarity to be had from this new book. Gamble, I should point out, may be a familiar face to you – he has fronted some TV series about his work and his charity, Worldwide Veterinary Services (WVS). I hadn’t seen any of his shows, but I was vaguely aware of him. The Vet begins with Gamble starting his first job after university, in a large mixed practice in the West Country. He has plenty of escapades with his local patients, and we also see the beginnings of WVS as he undertakes a few trips abroad with his friend Sam to work with animals (all the while Sam grumbling about Gamble’s taste in holidays). Gamble writes with an engaging style, and seems to really want everyone to feel involved in what he is writing about. His tales are humorous where appropriate, yet sometimes there is a feel that he may be trying too hard when he is self-deprecating. He actually writes better about the serious side of his work – the episode on a small Greek island when he and Sam are helping neuter local stray dogs is heartbreaking. Gamble was packed off to work for the Ministry of Agriculture during the Foot & Mouth crisis, and the section covering this time is truly harrowing. Animals may not have changed, but Gamble’s tales of them are not the same as Herriots. While Herriot wrote about animals which were real characters, Gamble’s choice of patients to write about is less about the character of the animal than the pickle it got him into. The tales are humorous certainly, but they are more about the human element than the animal. Aside from the time in which they were working, there are differences between the two vets. Herriot wanted only to enjoy his work and the countryside around him, and settle down with his wife; Gamble is much more high-flying, with big ambitions for his charity. Not that that’s a bad thing, I think his charity is brilliant – it just makes for a different character of narrator. Gamble is thinking about his next overseas adventure while Herriot is thinking about his tea. I feel rather bad constantly comparing Gamble with Herriot, but the comparisons are inevitable. Indeed, Gamble himself tells us in his acknowledgements that his mother gave him an anthology of Herriot’s books when he was a child with the inscription “one day you might write a book like this”. This is also flagged up in the press release, almost inviting comparisons. I’m sad to say that Gamble doesn’t match up to Herriot. I certainly enjoyed Gamble’s The Vet, but I think I would have enjoyed it much more without the thought of Herriot’s wonderful books in the back of my mind. Herriot’s writing had a certain magic or romanticism about it, which Gamble lacks – his writing is much more grounded (even on the first page of If Only They Could Talk, when Herriot is shoulder deep in a cow’s bottom, there is a certain romanticism). 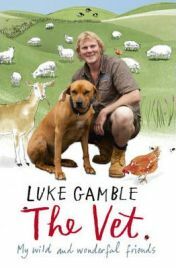 Luke Gamble’s The Vet is a pleasant and enjoyable read, and is certainly worth a go if you are interested in the work he has undertaken. But for the best tales of veterinary life, I would hope that even Gamble would agree with me when I say there is only one James Herriot. No Comments on "The Vet: My Wild and Wonderful Friends"